Britain's Olympic and world champion Adam Peaty was beaten into third place in the 50m breaststroke final at the European Short Course Championships. 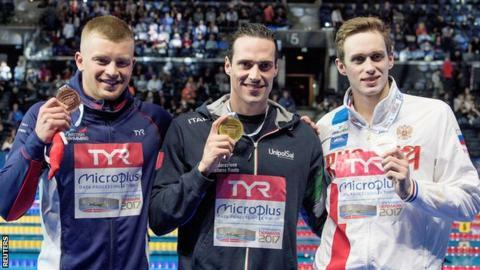 The 22-year-old, who twice broke the world record on his way to the world title in July, swam a short-course personal best of 25.70 seconds. Italy's Fabio Scozzoli won gold in a European record 25.62, with Kirill Prigoda of Russia second in 25.68. Peaty is also due to swim the 100m and 200m breaststroke in Denmark this week. Britain's most successful World Championship swimmer with five titles holds the long-course world record for 50m breaststroke - 25.95. The short-course pool is 25m and times are quicker because of more turns and the benefit of a push off the wall. The world record for short course remains at 25.25, set by South Africa's Cameron van der Burgh eight years ago. Next year Peaty will focus on the Commonwealth Games in April and August's European Championships.